Tennessee’s sports betting efforts this year appear to gaining serious momentum. 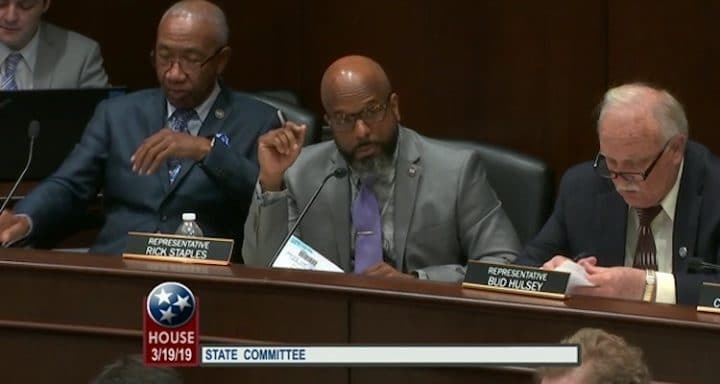 At a House committee hearing in Nashville on Tuesday, the sponsor of the sports betting legislation on the agenda unveiled significant proposed changes to the measure, House Bill 1. There wasn’t a vote held Tuesday, so the amendments weren’t approved, but they seemed to be received favorably by the committee. State Rep. Rick Staples, a Democrat, said Tuesday in front of his colleagues that the legislation would now call for mobile sports wagering only, while language to establish brick-and-mortar betting locations would be removed from the bill. An earlier version was eyeing 50 locations statewide, in addition to mobile platforms. Additionally, Staples proposed that the tax rate be raised from 10% to 20%, and to allow for 10 licenses for mobile betting operators/sportsbooks to enter Tennessee’s legal marketplace — at a cost of $750,000 per license. Under the new version, the 15-year-old Tennessee Lottery would regulate sports betting. The Tennessee Lottery already has some experience with a mobile application. Having the lottery regulate is a wise maneuver by backers of sports betting legalization and regulation. Rather than create a new government entity to oversee the activity, leaving it in the hands of a well-tested state agency could help sway Gov. Bill Lee, a Republican who has signaled significant apprehension to sports betting, citing concerns over whether it can be effectively regulated. Tennessee is eyeing a sports betting market worth nearly $150 mm each year in taxable revenues, based off roughly $3 billion in handle. As mentioned, the idea is that the market could support 10 operators. At a 20% tax rate, that projection would yield $30 million for the state annually. In addition to $7.5 million if all 10 licenses were claimed. Tuesday’s hearing was the first real substantive public dialogue on the sports betting legislation. Lawmakers talked briefly about the effectiveness of geolocation and age-verification technology. Colleagues of Staples were doing their due diligence by asking in a public forum whether or not Tennessee can prevent those in neighboring states from accessing the state’s sports betting apps. A representative from FanDuel appeared before the committee, telling policymakers briefly about the success of mobile betting in the state of New Jersey. The Garden State has brick-and-mortar sportsbooks, but more than 80% of the handle now comes over the internet. Tennessee is wise for its bullish position on mobile. An earlier version of the bill would require in-person registration to establish a mobile sports betting account, however by virtue of scrapping a brick-and-mortar plan, it seems likely that that requirement would get scrapped under the amendments. It’s unclear what will be done to the provisions in the bill that call for local governments to have a say over whether sports betting can occur within their respective jurisdictions. That wasn’t addressed Tuesday. No state in the country has a patchwork of ring-fenced sports betting micro-markets. Staples was also asked why the bill only mentions debit cards and not credit cards for funding mobile sports betting accounts. Staples said he intentionally left credit cards out of the bill. The meeting was adjourned without a vote on the proposed changes to the legislation. The chairman of the committee said the discussion on HB 1 will continue next week. Tennessee’s ongoing legislative session ends in mid-May, so there’s about two months left to pass the legislation. There’s also a companion measure in the Senate, but that proposal hasn’t had nearly the same activity as Staples’ bill in the House. Gov. Lee reportedly is involved with the ongoing evolution of the Staples’ sports betting legislation, a good sign for the bill continuing to advance in the legislative process over the coming weeks. With that said, it’s still too early to tell if this will be the year for legalization in the Volunteer State.